The following stacked line graph provides a history of the relative number of active Android devices running different versions of the Android platform. It also provides a valuable perspective of how many devices your application is compatible with, based on the platform version. Notice that the platform versions are stacked on top of each other with the oldest active version at the top. 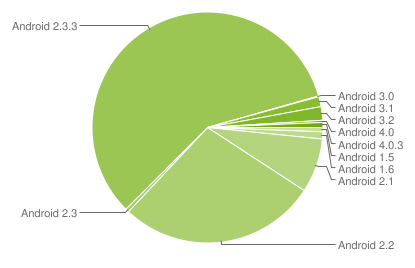 This format indicates the total percent of active devices that are compatible with a given version of Android. For example, if you develop your application for the version that is at the very top of the chart, then your application is compatible with 100% of active devices (and all future versions), because all Android APIs are forward compatible. Or, if you develop your application for a version lower on the chart, then it is currently compatible with the percentage of devices indicated on the y-axis, where the line for that version meets the y-axis on the right. Each dataset in the timeline is based on the number of Android devices that accessed Android Market within a 14-day period ending on the date indicated on the x-axis. This entry was posted on Tuesday, February 21st, 2012 at 8:40 am. You can follow any responses to this entry through the RSS 2.0 feed. You can leave a response, or trackback from your own site.